Free games: Win a Steam key for Debris, a co-op narrative game that explores psychosis! You are trapped under a surreal seascape, underneath the Arctic ice with no easy way out – you know what you could do with? A friend. Luckily, with its full release, Debris got a co-op mode, so you can bring one along with you. To celebrate, we’re giving the game away to some lucky winners. Keep reading to find out how you could win. Want more? Check out the best free PC games. 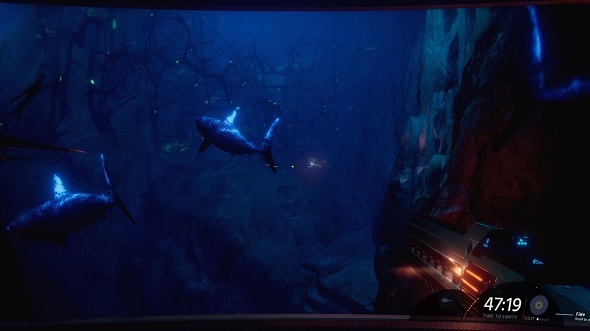 Debris is a first-person adventure about surviving the aftermath of an incident that has left you stranded in icy cold waters. Making matters worse, there are strange and deadly creatures lurking in the depths, and mysterious forces are trying to prevent you from making it back to safety. Previously, the game was single-player only, but now it has online co-op so you can experience it with a mate. Accordingly, the entire game has been overhauled with fixes and additions that better suit it to being beaten by two players – so this isn’t a lazily tacked-on mode. While this may sound like a survival game, perhaps similar to Subnautica, it is in fact a narrative game, so bear that in mind. It’s a story meant to be experienced by two people, with you unravelling mysteries and talking to other characters as well as each other as you progress. In fact, Debris gives you challenges that are based on those affected by psychosis, which is described as a “mental disorder in which thought and emotions are so impaired that contact is lost with external reality.” Medical professionals have advised the developers on how to design the game around this idea so that it explores the interplay between perception and reality. If you want to win one of the 25 Steam keys we have for Debris then you need to enter the competition via the widget below.Every action you complete is worth one entry into the giveaway, and the more actions you complete the more chance you’ll have of winning. We’ll also need your email address so we can send you a code upon winning – we won’t send you spam, we promise.